Chapter 1: Darwin and Spencer on the origin of music: is music the food of love? 6 Are There Emotional Universals in Human Music? 7 Are There Emotional Universals in Animal Calls? 8 How Do Animals Respond to Species-Relevant Music? 2 What Is Expert Performance? 3 How Is Expert Performance Achieved? 4 How Does Expert Performance Come About? Did you ever ask whether music makes people smart, why a Parkinson patient's gait is improved with marching tunes, and whether Robert Schumann was suffering from schizophrenia or Alzheimer's disease? 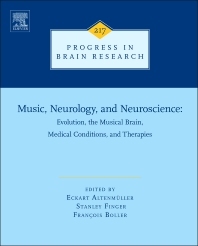 This broad but comprehensive book deals with history and new discoveries about music and the brain. It provides a multi-disciplinary overview on music processing, its effects on brain plasticity, and the healing power of music in neurological and psychiatric disorders. In this context, the disorders the plagued famous musicians and how they affected both performance and composition are critically discussed, and music as medicine, as well as music as a potential health hazard are examined. Among the other topics covered are: how music fit into early conceptions of localization of function in the brain, the cultural roots of music in evolution, and the important roles played by music in societies and educational systems. Comprehensiveness: This is the largest and most comprehensive volume on "music and neurology" ever written! Dr. Boller’s initial area of interest was aphasia and related disorders; he later became primarily interested in cognitive disorders and dementia with emphasis on the correlates of cognitive disorders with pathology, neurophysiology and imaging. He was one of the first to study the relation between Parkinson and Alzheimer disease, two processes that were thought to be unrelated. His current area of interest is Alzheimer’s disease and related disorders with emphasis on the early and late stages of the disease. He is also interested in the history of Neurosciences and is Past President of the International Society for the History of Neurosciences. He was the founding Editor-in-Chief of the European Journal of Neurology, the official Journal of the European Federation of Neurological Societies (now European Academy of Neurology). He is a Fellow of the American Academy of Neurology and a member of the American Neurological Association. In addition, he has chaired Committees within the International Neuropsychological Society, the International Neuropsychology Symposium, and the World Federation of Neurology (WFN). He has authored over 200 papers and books including the Handbook of Neuropsychology (Elsevier).